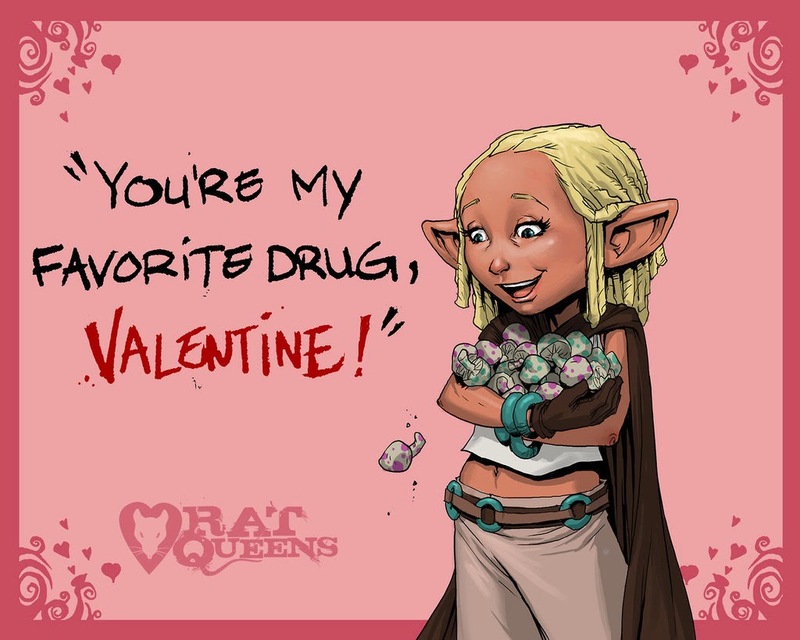 I’m back writing, today, Valentine’s Day, to review of the second issue of Rat Queens (October, 2013). When we last left our heroines they had just witnessed an assassin be reduced in a single blow to a gooey fluid by an angry rampaging troll… and now Violet and Hannah are arguing and trading racial slurs? Panel 2 is a great example of Kurtis Wiebe’s writing: a character believably frightened out of her wits. See it below, as it sends up at least three different comic book and two RPG tropes in one page. The following page demonstrates why a spell caster shouldn’t be in the front line of a fight, as the previously-mentioned troll grabs Hannah by an arm, crushes the arm, and flings her away. Roc Upchurch’s lavish illustration of the three other women versus the troll occupies most of the next five pages, and demonstrates his maturity (or perhaps it would be better termed creatively-focused immaturity) as a comic book artist. The Betty Climber, by the way, works well enough that Hannah was probably displaying poor judgment by arguing for something else. She gets a pair of (slightly dagger-pierced) troll eyes out of the fight as spell components. Speaking of Hannah, her arm is practically severed when we catch up with her in Panel 2 of page 7. Fortunately, Dee is really handy with magical healing. As the girls banter, we move on to the Peaches, who are in dire straits. Braga (about whom I wrote here) and Tizzie are badly hurt, and the latter is nearly out of spells; the other half of their party is either dead or in mortal peril. By the end of the page Allan has joined his deceased companion Keela. Soon after, their foe (an assassin) lies dead as well, having apparently mortally wounded Braga. The mood lightens briefly with some amusing bickering between Hannah and Tizzie. The two truly dislike one another, and seldom waste an opportunity to fight; it would be less amusing and more tiresome were Wiebe’s writing of them not so entertaining. But laughter dies quickly as the women talk among themselves about the obvious conclusion they’ve drawn from recent events: namely that someone in Palisade wants them dead. Most of the town might want them dead in theory, but someone actually tried to make it happen. The Rat Queens close the issue by honoring the dead in the way they know best: by indulging to the point of a monster hangover. This issue has a couple of amazing fight scenes and some really good artwork. Wiebe and Upchurch deliver a top-notch comic together. Despite the reasons for Upchurch’s departure from the book, I miss his work when Stjepan Sejic takes over in #9. There’s something about this comic that demands I write about it while listening to ’80s rock; it probably has to do with the surprisingly authentic ’80s-roleplaying vibe the story brings to the table. I would have loved to play in this RPG campaign back then if I had been smart enough to banter like this and had the taste for its completely bizarre action setpieces. I’m a obviously a fan of this comic and if you’re twisted in the same way I am, I think you will be too. In two weeks I’ll be back to talk about issue #3 and the evolving theme of the individual vs. society. And we leave with Betty, her magic mushrooms, and a Valentine of dubious provenance. Art © 2014 Roc Upchurch. Rat Queens #2 can be found on Comixology and Amazon.